This is the last week of the reno, more or less. The contractor leaves Saturday and returns in September. The master suite will be complete. The hardwood gets installed tomorrow, as does the bathroom vanity. The marble tile will be grouted today. Lets talk about the bathroom a little bit! - We put up a wall between the vanity and the toilet, for privacy, also, I saw this bathroom by Thom Filicia that I adored and I wanted to copy. - They trimmed the mirrors out in simple shaker panel. A last minute change. I wanted to trim them in marble, but the contractor thought it might be too clunky chunky. They are both good looks. From this angle it would have worked, but looking the other way, at the door, you would have run into problems with the light switches and the door casements. Plus a lot of grout lines. - The marble is calm, sedate. The best marble the contractor has worked with in thirty years! He speaks in superlatives, we get along. Gorgeous! Such an exciting week! can't wait to see this bathroom done! It will be amazing I am sure. loving all the marble ... all the way from the floor to the wall! What color are you painting the shaker panel? white as your window trim? sconces on mirror setup ... I DIED! 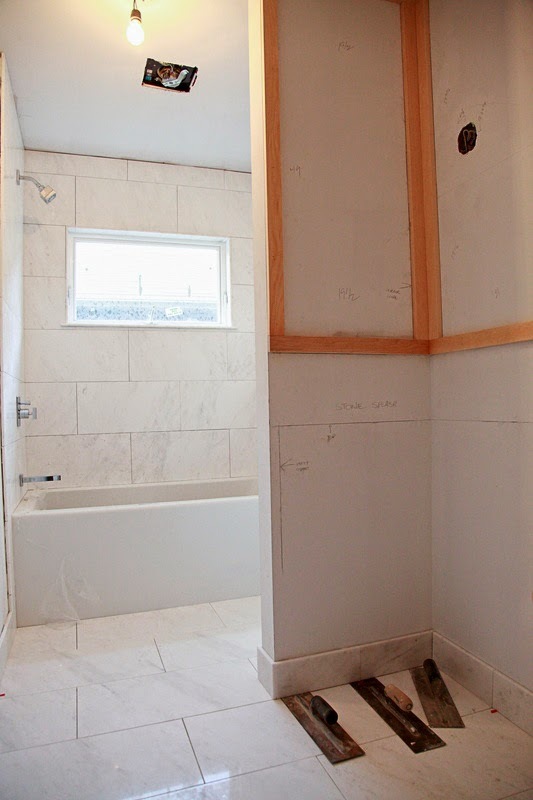 I really like the wall-in idea for the toilet, and wish we had done that in our master suite. The marble tiles look so quiet and clean. Great choice! LOVE your bathroom. Large marble tile all around is gorgeous! Will you tell us who your contractor is & how you found him? Shannon, we're considering bathroom tile right now and I was wondering if you could share how you feel about your marble in the master bath? it looks spectacular, I just worry that it would be hard to maintain unstained, un-yellowed over time. Is it bad that I want to completely copy your choices?